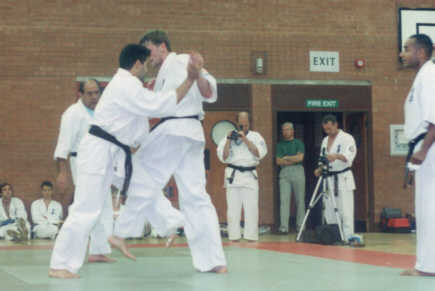 Carrying out a Kumite test in the British Karate Kyokushinkai under the tutorage of Hanshi Arneil is widely regarded as being the most difficult place to take the test. This is not only due to the calibre of opponents but also the ferociousness of the fighting. 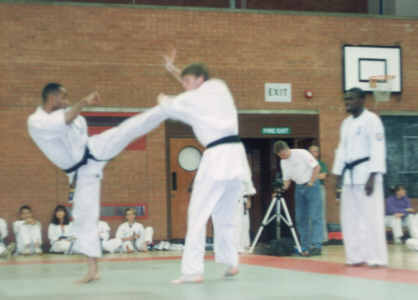 At the 1993 BKK Summer Camp Trevor Marriott, who was at the time the current British Open Heavyweight Champion and a veteran of two World Tournaments, decided to take his 50 Man Kumite test. 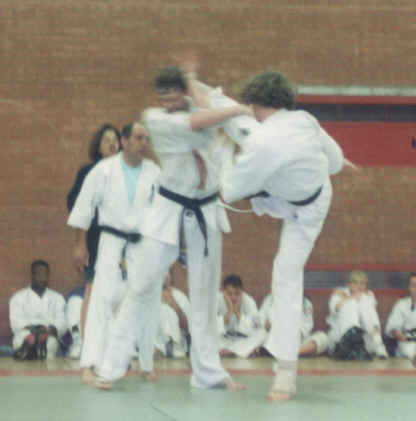 Among Trevor Marriott's opponents there where many world renowned fighters such as former British, European and Commonwealth champions Michael Thompson and Nick Da Costa, multiple British Champions and successful World Tournament fighters Jeff Whybrow, David Pickthall and Felix Ntumazah, later day IFK European Champion Piotr Szeligowski from Poland and European Cup winner Egil Arne Okland from Norway to name but a few. Trevor successfully completed the test in what turned out to be a gruelling succession of fights where all who witnessed it can pay testimony to the resilience, determination and courage shown to get through his final opponents despite carrying a number of injuries.